ARE YOU THINKING OF SELLING YOUR HOME? HERE ARE 6 FREE TIPS TO CONSIDER DOING BEFORE ANYTHING. their homes, they rarely realize how obvious odors can be to visitors. This is particularly true of pet owners and smokers. 2. Carpet and Flooring. One of the most visible areas of your home is your flooring. If your carpet is worn or dirty, get it replaced or cleaned. If you have vinyl flooring with corners coming up, get it glued down. Special note: Replacing flooring in smaller areas, such as kitchens, with high quality flooring can bring in premiums in price. 3. Paint and Walls. Paint is one of the least expensive ways to spruce-up your home. Consider painting outside trim and interior walls and doors. 4. Clutter. Excess clutter is a big buyer turn-off. You have to move anyway, so you might as well pack away items that make your home feel good to you, but turn off buyers. 5. Signs of Pests. If you have any sign of mice, rats, roaches, spiders, or bees, you should immediately contact a local pest control company and have them eliminated. There is no better way to show your home is filthy than by infestations. Remove all spider webs with a broom. 6. Landscaping. If your landscaping is messy, overgrown, or looks cluttered in any way, you need to fix it. Buyers make positive or negative conclusions about your home within the first five minutes. If you need help buying or selling a home please contact Michele Hanigan at DallasHomes@me.com or call/text 214-738-5555. Additionally, you can check out Park Cities / Dallas Real Estate Services. Selling a Home for Sale? Updates?? Check This Out…. Updating the outside of a home pays off, according to this year’s Cost vs. Value Report. Real estate professionals ranked exterior improvement projects as winning the buyers’ eye and providing sellers with the most return on investment. When buyers are shopping for a home, the exterior can make (or break) the first impression. According to the 2013 Cost vs. Value Report, exterior replacement projects are among the most valuable home improvements that sellers can currently invest in, starting with the front door. A steel entry door topped this year’s survey with an estimated 85.6 percent of the costs recouped at resale. The steel door replacement is also the least expensive of the 35 midrange and upscale remodeling projects included in the survey, costing $1,137 on average. This is the 15th year that Remodeling magazine — in cooperation with REALTOR® Magazine — has released the Cost vs. Value Report. This year’s survey included more than 3,900 appraisers, sales agents, and brokers across the country who provided their opinions and estimates. Exterior projects dominated the list with six of the top 10 most cost-effective midrange projects and eight of the top 10 upscale projects. Ending a six-year cost-value ratio decline, this year’s Cost vs. Value Report is good news for remodeling industry with a rise in the ratio by three percentage points to 60.6 percent. According to the report, lower construction costs and stabilizing house prices were the principal factors for the upturn. While every region improved over last year’s survey, the Pacific region — Alaska, California, Hawaii, Oregon, and Washington — had the highest average cost-to-value ratio overall at 71.2 percent, despite having the highest construction costs in the country. Visit www.costvsvalue.com to find information from the 81 cities included in the survey and download free PDFs that include specific market data. Site registration is required. Also visit HouseLogic.comfor a slideshow of the report’s results. This is a great article for those who are trying to sell a home in Dallas, Texas. There are a lot of homes for sale, so why not give your an edge? Is your listing suffering from the neutral blahs? It’s good to go neutral when selling a home so that you offer up potential buyers a blank canvas to imagine their own decorating, but too neutral can also make your listing look dull and forgettable. Using pops of color throughout the home’s interior can add more visual interest to rooms and even be used to enhance architectural details or create focal points that you want to make sure home buyers don’t miss. Try coordinating the trendy blues with yellow or lime green — “a great contrasting color can be a nice enhancement with a dark blue,” Woelfel says. 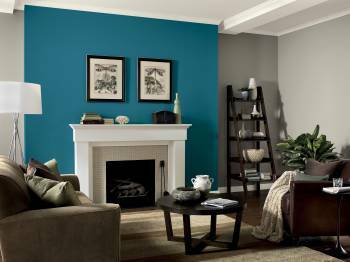 If you don’t want to paint an entire room a deep blue color, use it as a color for an accent or feature wall. “Paired with white furniture, blue walls can really pop and create a nice, relaxed atmosphere,” Woelfel says. Color block: Color blocking has become a popular fashion trend, and you can also use the idea to dress up your interiors. For more modern spaces, you could use color and geometry to give a neutral backdrop more visual interest. For example, the photo to the left shows an example of how color blocking is used to dress up a modern kitchen with neutral gray walls. In this example, the cabinets were painted blue and then colors of dark plum were added to create depth in the space as well as a light cognac brown to soften up the hues. Create a focal point: This is where accent or feature walls — painting one wall in a room a few shades darker or a more bold color — can really do the trick in leading buyers’ eyes to a place you don’t want them to miss. Feature walls can help you create a focal point in a room, such as in highlighting a fireplace or directing buyers to a hallway. Have some fun with your accent color: You could pick a trendy color here because it’s easy enough for someone to change and it won’t distract from the overall neutral tones of the home. Accessorize: You don’t have to commit to paint to add color punches. For example, in an all-white kitchen, add color pops through the accessories, like a red or orange colored small appliance, or a bowl of red apples or lemons. For a neutral living room, use color pops through the throw pillows, blankets, or the artwork to weave in color and more visual interest. Make more room: Reach for a darker tone to make a space feel roomier. Blues and greens may be a good choice, but you’ll need good lighting if you’ll be using darker tones. On the other hand, warmer colors — like reds, oranges, and yellows — are a color that move toward you in your vision. “They can make your walls feel closer, but it also can depend on the tone,” she notes. Are inspections tied to option periods? Does the buyer have to complete his inspections during the option period? No. The right to inspect the property is contained in Paragraph 7A of the contract and is not contractually tied to the termination option found in Paragraph 23. Most buyers will want to have their inspections completed during the option period so that they can exercise their right to terminate if they are not satisfied about the condition of the property after receiving the inspector’s report. The buyer has a right to re-inspect the property at reasonable times. 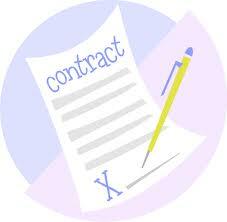 A seller who refuses to permit inspections at reasonable times would be in breach of the contract. Texas Housing Market Still Hot?? Is housing demand in Texas still hot? New data released today by the Texas Association of REALTORS® reveals that the demand for homes in Texas is still rising, and the median sales price hit another all-time high. The 2013-Q2 Texas Quarterly Housing Report shows 17.78% more home sales than the same quarter last year. The 79,760 single-family homes sold in the state in Q2 is the highest number of homes sold in a single quarter since the Texas Quarterly Housing Report was launched in 2009. The median sales price in 2013-Q2 was $177,300, up 9.98% from the prior year. The average sales price increased 10.44% from the prior year to $235,075 this quarter. Those are the highest figures for median and average price ever seen in Texas real estate. The inventory of Texas homes continued to shrink. For 2013-Q2, the Texas market featured 4.1 months of inventory, which is 30.5% less than the same quarter of last year. The report uses statistics from 48 multiple listing services in markets throughout Texas. Trying to sell your home? The best recommendation I have for homeowners was summed up in this fantastic video. Enjoy. For questions contact DallasHomes@me.com or text/call 214-738-5555 to sell or buy a home for sale. The Dallas-Fort Worth area’s hot housing market is kicking off the summer with big gains. North Texas home starts rose by almost a third in the second quarter as builders hustled to keep up with buyer demand. And sales of pre-owned homes were 12 percent higher in June than a year earlier. Dallas-Fort Worth homebuilders started almost 6,000 homes in the second quarter — the highest quarterly homebuilding total in this area in five years, according to a new report from Metrostudy Inc.
Home starts in North Texas have been steadily rising since 2011. “I think we are still in the early stages of a recovery,” said David Brown, regional director of Metrostudy’s Dallas-Fort Worth office. “We’re still at almost 60 percent below where we were building at the peak,” before the recession. Brown said he anticipates that builders will start about 22,000 houses in the D-FW area this year, compared with fewer than 18,000 starts in 2012. Local builders sold 5,147 houses in the three months ending with June — a 25 percent increase from second quarter 2012. “Homebuilders continued to report strong year-over-year gains in net sales during the quarter,” Brown said. Dallas builder Miles Durham is busy starting houses in several northeast Dallas locations. He’s just begun work on the first of seven homes on Fisher Road near Lakewood. The supply of new homes available for purchase is still at rock-bottom levels. Dallas-based Residential Strategies said in a new report that at the end of the second quarter there were only 2,653 finished, vacant houses available in the D-FW area. Builders are also having a tough time finding ready, affordable home construction sites. Wilson said that recent increases in home finance costs so far aren’t enough to affect the housing market. “Yes, while mortgage rates have gone up — and it’s too bad if you missed the bottom of the market — they are still extremely attractive,” he said. “It has certainly been a very strong spring market. The supply of pre-owned houses for sale in the D-FW area also continues to be tight. The number of North Texas houses listed for sale with real estate agents was down 19 percent last month from June 2012, according to the Real Estate Center at Texas A&M University and North Texas Real Estate Information Systems. There is just over a three-month supply of homes listed for sale with real estate agents in the more than 50-county area. With the latest gains, pre-owned home sales in the region are up 19 percent in the first half of 2013 compared with year-ago levels. Real estate agents in June sold 8,708 pre-owned single-family homes in North Texas. Median pre-owned home sales prices in June rose 13 percent to a record $185,820. 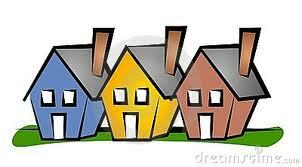 So far in 2013, median home sales prices in North Texas are 10 percent higher than the first half of 2012. If you need help buying or selling a home or have questions, please contact Michele Hanigan at DallasHomes@me.com or call/text 214-738-5555. Additionally, you can check out the Facebook business page at Park Cities / Dallas Real Estate Services.